In September, the national unemployment rate fell to 5.9 percent, the lowest it’s been since July 2008. Yet, even as the recovery moves ahead slowly, conditions vary greatly across states and across racial and ethnic groups. In September, state unemployment rates ranged from a high of 7.9 percent in Georgia to a low of 2.8 percent in North Dakota. Nationally, African Americans had the highest unemployment rate, at 11.0 percent, followed by Latinos (6.9 percent), whites (5.1 percent), and Asians (4.3 percent, not seasonally adjusted). 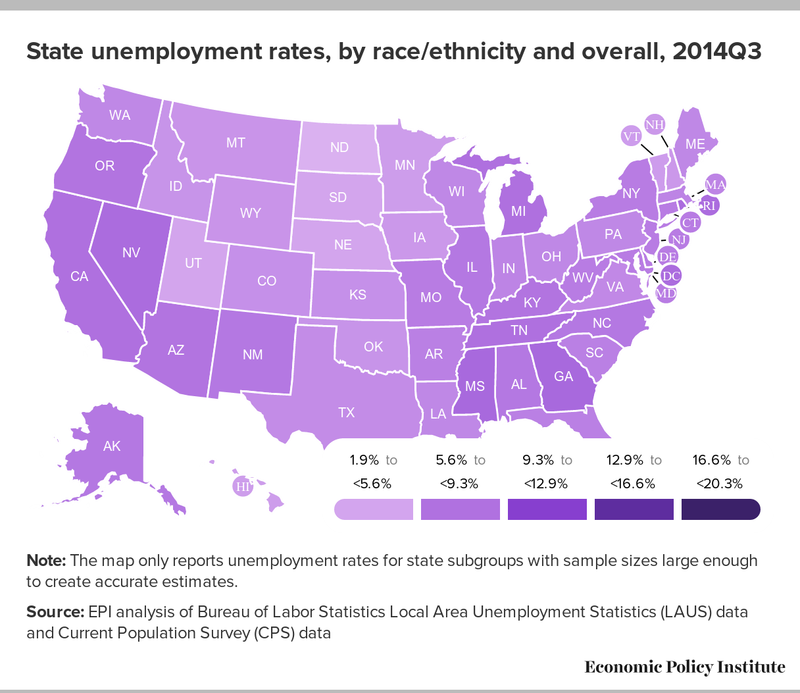 Following is an overview of state unemployment rates by race and racial gaps in unemployment for the third quarter of 2014. We provide this analysis on a quarterly basis in order to generate a sample size large enough to create reliable estimates of unemployment rates by race at the state level. In the analysis below and in the accompanying interactive map and tables, we only report estimates for states where the sample sizes of these subgroups are large enough to create accurate estimates. Note: The map only reports unemployment rates for state subgroups with sample sizes large enough to create accurate estimates. In the third quarter of 2014, the white unemployment rate was lowest in North Dakota (1.9 percent) and highest in Nevada (7.2 percent), as shown in the interactive map, which presents state unemployment rates by race and ethnicity. As shown in Table 1, which displays changes in state unemployment rates by race and ethnicity from the fourth quarter of 2007 to the third quarter of 2014, Nevada was also the state where the white unemployment rate remains most elevated above its pre-recession level—2.9 percentage points higher than in the fourth quarter of 2007. On the other hand, the white unemployment rate has reached its pre-recession level in six states: Hawaii, Michigan, Minnesota, North Dakota, Massachusetts, and Vermont. The African American unemployment rate was lowest in Virginia (8.2 percent) and highest in Nevada (16.8 percent) and Michigan (16.7 percent). By way of comparison, although 8.2 percent is the lowest black unemployment rate in the country, it is still 1 percentage point above the highest white unemployment rate (Nevada’s). Virginia was one of only seven states where the African American unemployment rate was below 10 percent in the third quarter of 2014. As shown in Table 2, which displays the black–white and Hispanic–white unemployment rate ratios in the third quarter of 2014, the black–white unemployment rate gap was also smallest in Virginia. In that state, the black unemployment rate was 1.6 times the white unemployment rate. The largest gap was in the District of Columbia, where the black unemployment rate was 5.4 times the white rate. With regard to recovery, the African American unemployment rate has reached its pre-recession level in Ohio and South Carolina, but remains most elevated above its pre-recession level in Alabama (7.1 percentage points higher). Before the recession, Ohio had the second-highest African American unemployment rate in the nation. So although the rate has returned to its pre-recession level, it remains above the national average for African Americans. Before the recession, Alabama had one of the lowest African American unemployment rates in the country (5.3 percent). The Hispanic unemployment rate was highest in Rhode Island (20.3 percent) and lowest in the District of Columbia (3.0 percent). Since 2007, Rhode Island has seen tremendous growth in its Hispanic population, and the state’s Hispanic unemployment rate exceeds its pre-recession level by a whopping 13 percentage points.1 As a result, the Hispanic unemployment rate in Rhode Island is now 3.7 times the state’s white unemployment rate. According to the American Community Survey (ACS), from 2007 to 2013, the Hispanic population in Rhode Island grew by 20.1 percent, while the state’s overall population actually declined slightly. That rate of population growth is likely the result of increased immigration, so the elevated Hispanic unemployment rate partly reflects labor market challenges faced by recent immigrant populations. The Hispanic unemployment rate has reached its pre-recession level in Georgia and Colorado. In Colorado, the Hispanic unemployment rate was also lower than the national average in the fourth quarter of 2007, and remains so currently. The Hispanic–white unemployment rate gap is smallest in Virginia, where the Hispanic unemployment rate is 0.9 times the white rate. The Asian unemployment rate was lowest in Washington state (2.5 percent) and highest in California (5.9 percent). A recent EPI analysis of 2013 ACS data reveals variation in economic well-being across different Asian ethnic populations. This variation is more likely to be reflected in states where the Asian population is larger and more diverse, like California. Similarly, the Asian unemployment rate remains most elevated above pre-recession levels in New Jersey (2.5 percentage points) and New York (2.4 percentage points). The Asian unemployment rate has reached its pre-recession level in Nevada and Washington state. 0.8 ppt. 2.7 ppt. 1.3 ppt. 1.2 ppt. Note: The table only reports data for state subgroups with sample sizes large enough to create accurate estimates. The unemployment rate estimates in this issue brief are based on the Local Area Unemployment Statistics (LAUS) and the Current Population Survey (CPS) from the Bureau of Labor Statistics. The overall state unemployment rate is taken directly from the LAUS. CPS six-month ratios are applied to LAUS data to calculate the rates by race and ethnicity. For each state subgroup, we calculate the unemployment rate using the past six months of CPS data. We then find the ratio of this subgroup rate to the state unemployment rate using the same period of CPS data. This gives us an estimate of how the subgroup compares to the state overall. While this methodology allows us to calculate unemployment-rate estimates at the state level by race by quarter, it is less precise at the national level than simply using the CPS. Thus, the national-level estimates may differ from direct CPS estimates. In many states, the sample size of these subgroups is not large enough to create an accurate estimate of their unemployment rate. We only report data for groups which had, on average, a sample size of at least 700 in the labor force for each six-month period. 1. In the fourth quarter of 2007, the sample size for the Hispanic workforce in Rhode Island was 659, which is just below our threshold of 700. The Hispanic unemployment rate for Rhode Island in the CPS (before making the adjustments described in the Methodology section) was 6.4 percent, with a margin of error of +/- 1.6 percentage points. For the third quarter of 2014, the state’s Hispanic unemployment rate in the CPS (unadjusted) was 19.8 percent, with a margin of error of +/- 2.7 percentage points.